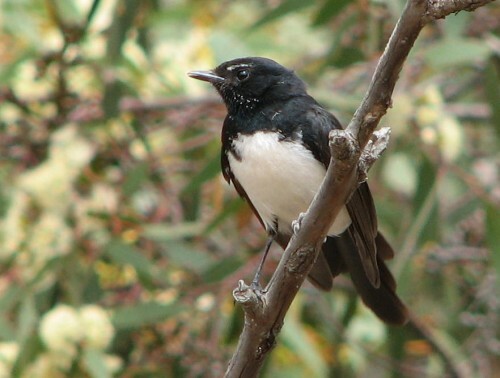 A few days ago I wrote about our feisty Willie Wagtail (click here to read the article). I made some comments about some of the birds I had seen our resident Willie Wagtails chasing off from near their nest. They can get very protective of the nest, the eggs and especially the young once they hatch. Yesterday I looked out of the window and saw it again attacking a much larger bird. Because of the distance – about 40 metres – I was not sure what it actually was, but it was ducking every few seconds as the Willie Wagtail attacked its head. Fortunately my binoculars were within reach but as I grabbed them the bird flew off to another part of the garden near the front of the house with the noisy Willie Wagtail snapping at its tail. I went to the sun room and looked out at a bush nearby. The much larger Collared Sparrowhawk was cowering in bush, trying valiantly to escape from this angry little bird. I was able to get a good view of the hawk before it flew off again, hotly pursued by the Willie Wagtail until it was well away from the nest. Their resilience and sheer bravery in the face of great odds always amazes me. Quite the inspirational little bird. The photos on this post were taken some time ago. I should keep my camera handy too. We are on the road again – once again to Sydney so we can spend time with the grandchildren during the school holidays. Such a hard life. I haven’t been able to add much here on this site in recent weeks. Between my wife and I we seem to have been on the road so many times in recent weeks in order to keep doctors’ and specialists’ appointments, most of them in Adelaide about 80km from home. Now we have a 4 week window we had blocked out on our calendar to undertake this current trip to Sydney. While most of our time will be spent with the family, I am sure that I will get a few opportunities to do some birding. I also have had a few good sightings at home in recent weeks that I must write about too. I am writing this from our cabin in a caravan park in Hay in far western New South Wales, just over 700 kilometres from Sydney, another day’s journey to go. Just west of Hay we traversed the Hay Plain, a long, extremely flat landscape dominated by saltbush and little else. Usually the birding on this stretch of road is very interesting, and I often ask my wife to drive that section – so I can watch out for and record the birds I see going along. It’s not a great long list, but it was enough to more or less keep me happy. A little while ago I was outside in the garden attending to one of those mundane jobs around the house. Okay, I’ll admit I was checking the washing hanging out to dry. My attention was suddenly grabbed by a great uproar coming from the local resident honeyeaters. They were creating a terrible noise, so I knew that something was disturbing them big time. 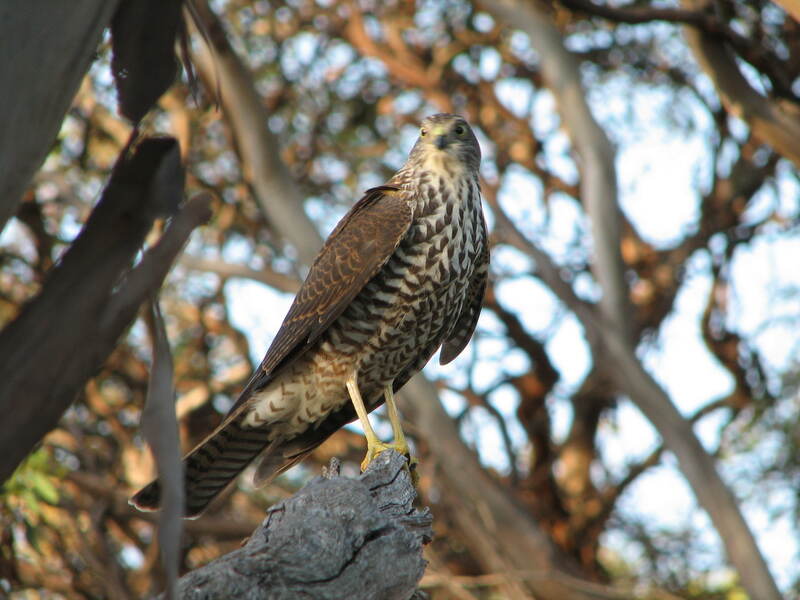 As I looked around a Collared Sparrowhawk (see photo above) landed on the power line coming in towards the house. Next thing, it took off after its lunch – a Common Starling. Well, I’m not sure if it actually caught its prey. The last I saw of them was the starling zooming a full speed across the garden and then weaving through the mallee scrub behind our house, hotly pursued at full speed by the hawk. I was amazed at how fast they were going, but when you consider those sharp talons, one can hardly blame the starling for getting a move on. Many people enjoy seeing birds, especially those that visit their gardens. People also enjoy seeing birds in parks and reserves, on the beach or along rivers. They are variously described as “cute”, “pretty”, “delightful”, “wonderful” and many other such “nice” words. Rarely are they described as gory, or brutal or even dangerous. The stark reality is that while many birds are indeed stunning in their colours, amazing in their survival instincts and quite fascinating in their behaviour, some species do have a gory, brutal (in human terms) side to their lives. A few days ago I was hanging up the washing on the clothes line – or getting it off – whatever – and there was a sudden noisy kerfuffle in the trees nearby. The various honeyeater species were totally upset – and with good reason. A Collared Sparrow-hawk flew ponderously to a branch nearby, clutching a struggling bird in its talons. The sparrow-hawk proceeded to gouge chunks of flesh off the hapless bird, feathers scattering in the breeze and all the while the rest of the avian community voiced their disapproval – or fears. I tried to sneak up for a closer look. I quickly dismissed the idea of racing inside to get the camera. It appeared to be a White-plumed Honeyeater being eaten. This is the reality of life in the raw. To survive, the sparrow-hawk must eat. One bird’s death means another bird’s survival. In human terms it seems cruel and gory, but this is the way of web of life. I didn’t get a photo, so I’ve included one below that I took some years ago. This article was last update on 10th October 2015. One of the spectacular birds I saw on my visit to Ethiopia last December was the Lammergeier, or Bearded Vulture, Gypaetus barbatus. Although I was very pleased to see this bird, it couldn’t be counted as a “lifer“. I had previously seen the species in the Himalayas in Nepal. Being members of the vulture family of birds, their diet features carrion. A high proportion of their diet is bone marrow and they are very adept at carrying a bone on high and dropping it onto rocks to break it. They are also able to easily digest whole bones they have swallowed. This one soared effortlessly on the thermals not far above our heads when we were having a picnic lunch at Portuguese Bridge, about 100km north of Addis Ababa. At first glance I identified it as a Lammergeier and wrote that down in my notebook. Several months later while preparing this article I started to have a few doubts. Could it be something else? Then I discovered that the tail shape is somewhat diagnostic; there’s nothing quite like it in the raptor family. You are currently browsing the archives for the Raptors category.